I'm George Mott (center), and these are my two sons Steve (left) and Matt (right). When you buy something from us, whether a shed, gazebo, playhouse or anything else we sell, you can be sure you will feel good about doing business with us. 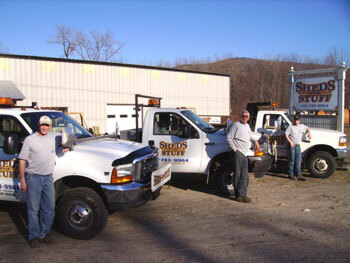 We are a local establishment and have been a family owned and run business for over 20 years here in Berkshire County. Stop down sometime and look around, there is always something here at Sheds N Stuff to make your yard a little nicer. 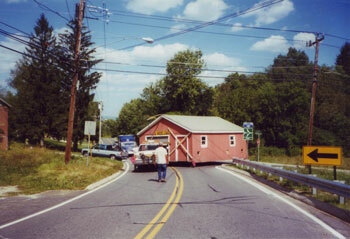 We also operate a building moving service and have over 25 years experience doing so. A little advice... do not try this yourself.